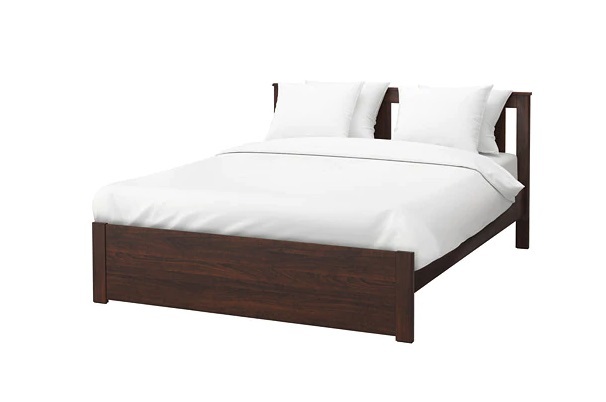 The Songesand bed frame comes in colors such as white and brown. It is ideal for all types of homes because of the simple and versatile design features the bed frame exhibits. The Songesand bed frame has been made in measurements to accommodate the double mattresses, Queen Size, and King size mattresses. The existence of options makes it easier for buyers to choose the right bed for different spaces. The Songesand bedframe has a classic look that can fit into the modern design of your bedroom or hostel. The design has been carefully structured to have features that can remain attractive for many years without looking outdated. Asides from the soft and gentle appearance of the white model for this product, buyers will also be happy with the sturdy design of the Songesand bedframe. It has been made from fibre board, particle board, and ABS plastic. These materials have been engineered to make up the bed frame, which includes the joints, headboard, the legs, and the frame. The choice of ABS plastic is because of its versatile features and strength which accommodates the mattresses and weight of the users. ABS plastic can be found in parts of the bed frame such as the legs, top rail, and the sides of the frame. The particle board was essentially used in making the filling at the bed end. Particle board is known to be lightweight, durable, and easy to maintain, which means the maintenance of this bed frame is going to be easy and sustainable. In addition to the bed frame, a mid-beam has been added to provide additional support while the product is in use. Considering that different types of mattresses can be used with this product, the mid beam has been fortified to support the weight of all users regardless of the type of mattress that will be placed on the bed frame. The fortified mid beam is made from galvanised steel. The choice of a centre support beam is necessary to give all users a better experience with the product. The option of using different types of mattresses with this bed frame will encourage more buyers who have special preferences regarding mattresses. With the Songesand bed frame, mattresses of different thicknesses can be used for as long as the owner is comfortable because the sides can be adjusted to accommodate the mattress the owner has purchased for use with this bed frame. Depending on factors such as budget or medical needs, users of this product may need to use mattresses of different thicknesses; the design used for this bed frame makes it possible to achieve this goal without the bedframe looking absurd after placing the mattress on it. For all users who need to manage their space, the Songesand bedframe design features provide enough room below the bed frame. This space can be used in many ways to the advantage of the user. It is possible to use the space beneath as a temporary or permanent storage space for furniture and other storage in the room. In bedrooms where the owners need to avoid clutter, the storage space beneath this bed frame will be sufficient to keep all types of things. The bed frame stands at the height of 41 cm, taking the measurement from the footboard. This gives all users the opportunity to have more options when choosing their mattresses. Give or take, when the mattress has been placed on the bed frame, the total height added should not be more than 52 cm. At this height, it is easy for both the young and older adults to use the bed easily. Considerations such as rising from the bed, especially in the case of older adults, will not be a problem because of the height from the ground. 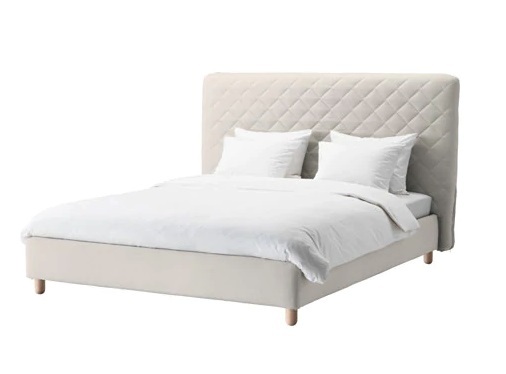 The headboard measures 95 cm, other parts of the bed frame such as the height under the furniture measure 20 cm, while the length is 208cm, and the Songesand bed frame has a width of 165 cm. These measurements have been applied in line with creating a bed frame that can be used by everyone without experiencing limitations such as the available space in the room and size of mattresses the owner wishes to place on the bed. Assembly of this bed frame is easy. After purchase, the owner is provided with the instructions for assembly which have been included in the packaging. This information can also be accessed online from the IKEA website or other helpful links online. Buyers who will not be open to attempting the assembly can also use the local task services. The simple design of this bed frame is an assurance that assembly can be completed in a few minutes. The product package includes only the Songesand bed frame. However, getting matching linen, beddings and the right mattress for use with this product should not be difficult. The recommended care and maintenance tips for this bed frame are simple. These maintenance processes are also quite sustainable, so it will not be difficult for the user to perform cleaning as often as necessary. Cleaning the bedframe when needed will also increase the number of years it can be used. Some simple tips for cleaning this bedframe are; the use of a damp cloth to wipe parts of the bed frame such as the headboard, footboard and the bedsides. When needed, dry cloth can also be used to quickly wipe stains off the bedframe as soon as they are noticed. Routinely, a mild cleaning product can be used to wipe the parts of the bed frame made from ABS plastic to give it a shine. Overall, the bed frame has a good design and can match the needs of a wide audience. The profile edges on this bedframe also make them suitable for use in homes where little children or older adults live. The profiled edges reduce the chance of injury and also add to the attractive appearance of the bed frame. The easy installation, and versatile features count as a plus for this product, however, some people may not be comfortable with the availability of only two colors (white and brown) for this bed frame. The IKEA SNEFJORD bed frame has versatile features that add to its functionality and value when used in homes. The design of this bed frame features a soft and comfortable headboard. The headboard forms the entire part of the frame which reaches the ground. The broad base forms a solid balance that holds the bed frame in place. The headboard has also been covered with a nice fabric that can be easily cleaned to remove stains or dust. The headboard has been filled with polyester wadding. This is the material that provides the soft and comfortable feel of the headboard. Also, some quantity of polyurethane foam has been added to the headboard to increase its firmness and comfort. The different parts of the headboard have been made from solid beech, plywood, fibre board, and solid pine. The bed frame has been designed to accommodate the queen-sized mattresses which have features that meet the users’ needs for space and comfort. The queen sized mattresses of different types can be used with the SNEFJORD bed frame. For example, mattresses with spring boxes or different types of foams can be used with this bed frame. The finishing design used for the SNEFJORD bed frame is done by covering the wood with good quality fabric. The fabric used is made from 64% cotton and 36% polyester. The filling that has been used to create durable padding around the bed frame is done with the use of polyester wadding which is durable and held firmly in the bed frame fabric. The lining for this bed frame is done with polypropylene. The choice of polypropylene makes the finishing neat and more durable; it is, however, not woven, so the finishing is more appealing. The legs that support this bed frame are made from solid birch. The legs are sturdy and can adequately withstand the weight of all users. The legs or this bed frame are equal and have been positioned to ensure balance regardless of the type of mattress placed on the bed frame. The legs have also been neatly finished. The finishing work done on the legs of this bed frame gives them a brownish shade that matches the beige colour of the fabric used to wrap other parts of the bed frame. The side panel has been made with quality plywood. The plywood runs through the entire length of the side panel. It is firmly secured to the head and leg board using durable steel fittings for plywood. The filling done for the side panels also features the polyester wadding that has been used for the other parts of this bed frame. The side panel is high enough to support the mattress that will be used with this bed frame. The measurement of these side panels makes it easy for all users to get up from the bed easily (without putting too much pressure on the legs) after sleeping through the night. Around the bed frame, there are metal fittings which have been strategically positioned to hold the entire bed frame in place after it has been assembled. These metal fittings can be found at the corners around the bed frame. They are made from steel and are durable. When necessary, the metal fittings can be adjusted to the adequate fitting which is suitable for the mattress that will be used with the bed frame. 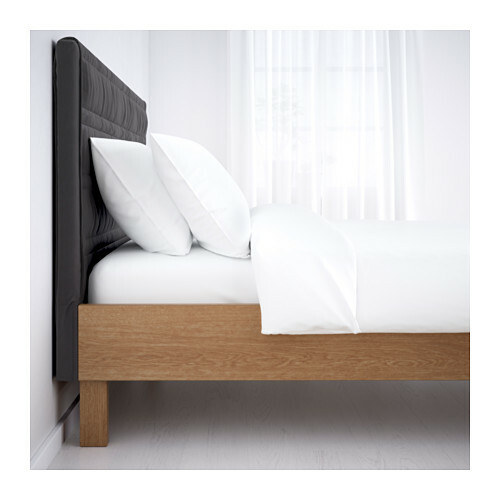 The SNEFJORD bed frame also features a SKORVA centre support beam. The function of this support beam is to provide additional support to the bed frame. The centre support beam beneath the bed frame helps to distribute the weight of the users, preventing the exertion of too much pressure on a particular part of the bed frame while it is in use. The SKORVA centre support beam that comes with this bed frame is made from galvanised steel which is known for its versatility, and durability. The design of this bed frame has also been done to give the buyer more control over their space. The required space for this product is minimal. This means buyers can enjoy the comfort of this bed without compromising their bedroom space. The size of this bed frame makes it easy to blend with other décor features the buyer has added to make their bedroom space more comfortable. The SNEFJORD bed frame is also a perfect match for other similar products that fall into the bedroom furniture category. This means it will be easy for the buyer to find suitable furniture to match this bed frame and complete the design of their bedrooms. While the mattresses that can be used will vary, different designs of beddings will give the room a unique glow to meet the owner’s needs for aesthetics. 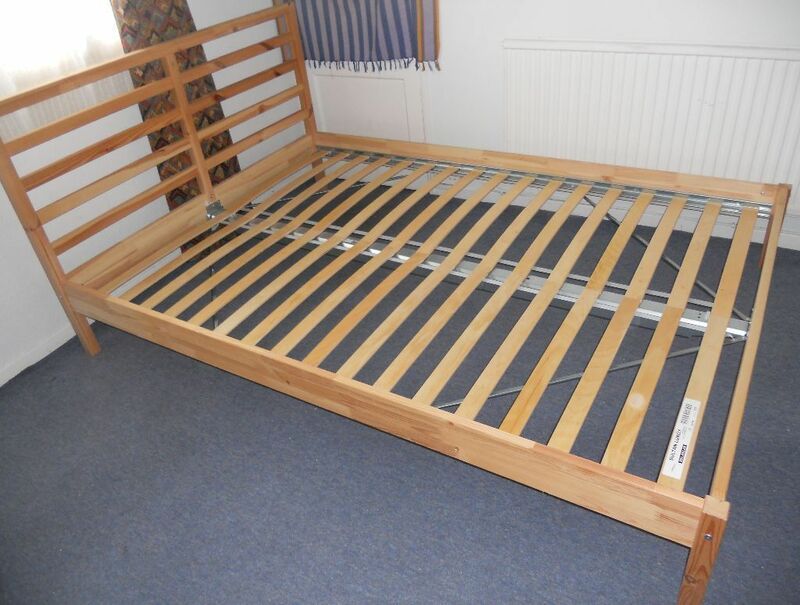 The bed frame also has a slatted base. The slats are made from solid wood, and they are durable. Slats perform the function of supporting the bed frame while it is in use. The slatted bases are usually positioned in a perpendicular alignment with the side panels of the bed frame. They provide a medium for the proper distribution of weight and overall firmness of the bed frame. Slatted bases are also needed to prevent wear and tear which can make the bed frame last much longer. The upholstery work on the headboard and the side panels will not make it more difficult to maintain this bed frame because of the fabric used in the finishing. The fabric can be easily cleaned using a wet cloth and a mild liquid cleaning product. It is, however, a good idea to use clear cleaning liquid products rather than coloured products to avoid staining the beige fabric. The bed frame can be easily assembled after purchase. The guide for assembly can be downloaded from the website; the download contains simple steps to follow while assembling the different parts of this bed frame which include the headboard, side panels, and the footboard. Overall, the bed frame which is a combination of veneer and laminates, steel, and solid wood is a durable product which offers comfort and value. The Ikea NORDLI bed frame is designed to accommodate the standard queen size mattress. It is spacious and can be comfortably used by two adults. The bed frame has diverse features that have been added to meet the user’s need for comfort and utility. The comfort derived from the queen size mattress used for this bed frame is one of the features it has that can increase the bed frame’s value in the market. Buyers will be happy to know that a couple can sleep comfortably on this bed frame without desiring more space. In addition to its other features, comfort while sleeping is one of the most significant factors buyers consider when shopping for bed frames. Considering the measurements of this bed frame, the mattress size that will be a perfect fit is as follows; a mattress with measurements between 59’’ - 63’’ width, and 79 ½ ‘’ in length. The NORDLI bed frame comes in the anthracite colour (which is a deep beautiful shade of grey); it is a colour that easily blends into the colour theme of a room. Without the hindrance of colour options when choosing bed frames, this product will be a good option for people who need to avoid buying a bed frame that is in contrast with their already selected bed room colour themes. The anthracite shade used in the design of this bed frame is also easily matched with different types and colours of beddings. The multiple options of beddings that can be used in this regard make the NORDLI bed frame an easy choice for buyers. 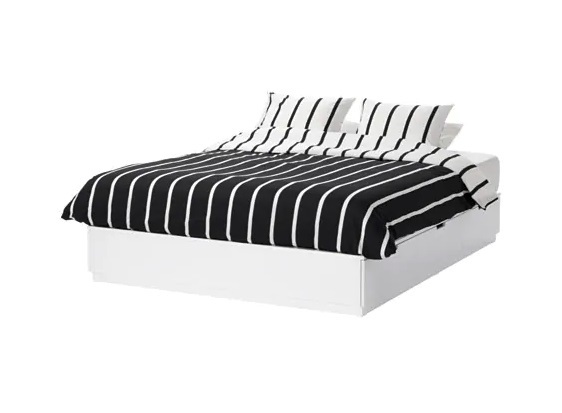 The NORDLI bed frame also features six large sized drawers. 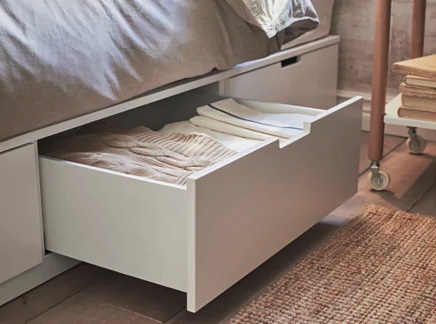 These drawers have been positioned beneath the bed frame in a simple and neat design that blends with the general appearance of the bed frame. The designers of this bed frame have included the six large sized drawers to serve as extra storage spaces in the bedroom. This bed frame design allows the owner to manage the available space in a bedroom without difficulty. The six drawers have been carefully constructed with solid fibre boards which are known for their aesthetic value and durability. The finishing inside and on the front of each drawer has been done with printed acrylic paint that blends with the other parts of the bed frame. Over time, users of this bed frame can continue to have functional drawers that open and close without making squeaky noises. The functionality that enables smooth, noiseless operation is achieved with the addition of a set of dampers in the drawer’s functional mechanism. The dampers make it possible for the drawers to be opened and closed softly without causing noise or disturbance to the people still sleeping on the bed. This function will be quite useful when the NORDLI bed frame is set up in children’s bedrooms. Beneath the NORDLI bed frame is the slatted base. For many reasons, many beds need well-formed slatted bases because of their versatile use. In the case of this product, the slatted base is made from solid pine. 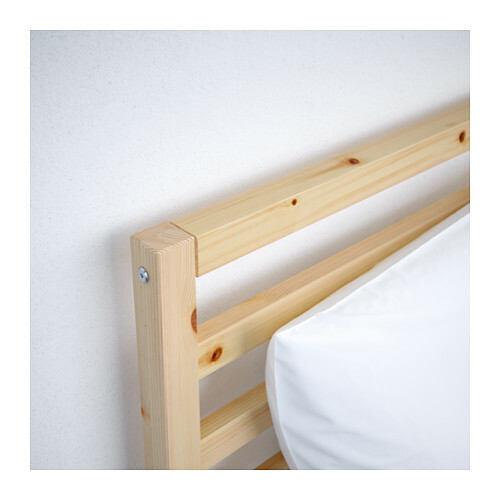 The choice of solid pine is to promote the functions of the slatted base such as an absorbing the weight of the people who will sleep on the mattress. 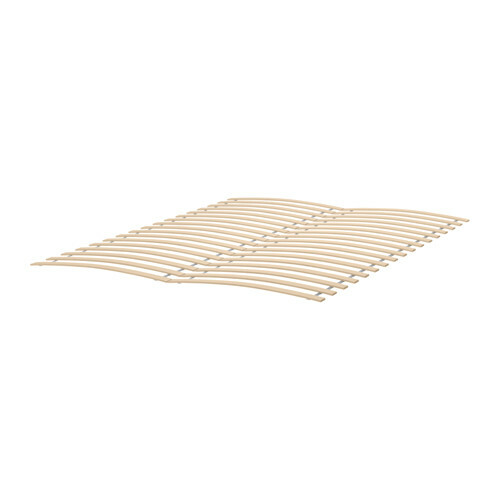 Slats are good with different types of foams; this gives the owner of this bed frame a wide range of options when they need to buy the right mattress for their NORDLI bed frame. The slatted base, which can also be adjusted to fit the type of mattress used, is also essential for the purpose of weight distribution when the owners sleep on the bed. The importance of weight distribution helps to prevent excessive pressure on one part of the bed frame. Slats are therefore necessary to prevent quick wear and tear of the bed. 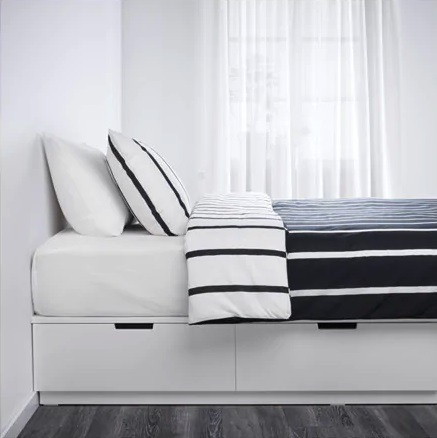 The use of a slatted base for the NORDLI bedframe eliminates the need for a mid-beam beneath the bed frame. 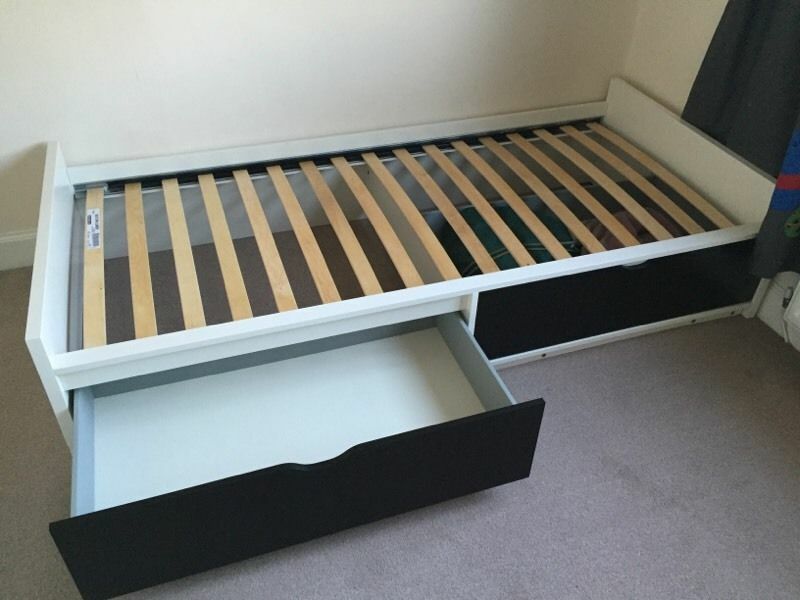 The slats support the entire bed frame and the large sized drawers. The bed frame has many functional parts that have been combined to form the entire structure. For example, there are parts of the bed frame made from particle board, ABS plastic, and other parts have been designed with materials such as fibre board. The finishing used for the bed frame is done with Acrylic paint to give it a smooth and neat look. The rails of this bed frame are made from solid birch. The inclusion of solid birch in this design is also important to support the entire structure of the bed frame. The rails are tough and durable. The users of this bed frame can rely on these solid rails to last for many years and provide the value that is needed from a strong and durable bed frame. As an added protection, this bed frame can be fitted with FIXA stick on products. These are durable materials strategically placed beneath the lower surface of the bed frame to prevent wear and tear during use. The stick on protectors can last for many years, thus reducing the need to change them frequently after application on the lower sides of the bed frame. The NORDLI bed frame is easy to set up. The product manual acts as a guide when setting up the bed frame. It can be downloaded online following the guidelines on the Ikea website. However, owners can request expert assistance to quickly set up the bed frame in few minutes. The instructions for care and maintenance are simple and can be done routinely or when needed. Spills, stains or other kinds of dirt can be simply removed with the use of a wet cloth. Dry cloths can also be used when necessary to remove stains quickly. Also, owners of this bed frame should choose a mild cleaning liquid when the need to clean the bed frame with such products arises. 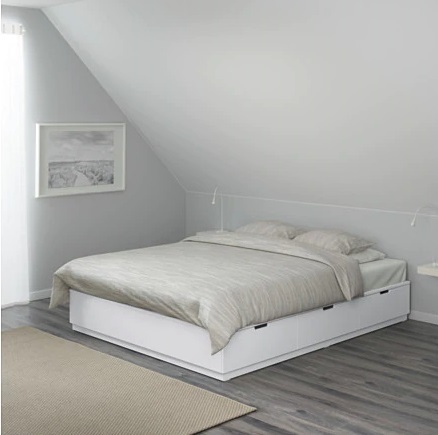 The NORDLI bed frame is a good option for people who need a comfortable bed and the advantage of adequate storage space. It has a flexible design and can be used by adults and teenagers. Single bed frames such as the NEIDEN product from Ikea are now very popular because of their versatile use. The bed frame can be used in every type of home regardless of size or location. The versatility of the NEIDEN bed frame adds to the reasons many users consider buying it in their homes. One feature that we instantly noticed was the attractive finishing of the NEIDEN bed frame. It is made from pine wood, and this will appeal to people out there who would rather use a bed frame made from high-quality wood. Pine has been used for making bed frames and other furniture for a very long time because it is versatile, durable, and easy to work with. So we were not surprised to know pine was used in the manufacture of this bed frame. A look at the bed frame immediately gives you the impression that it can be suitable for any room in the home regardless of the people who will use the bed. This is because it has been constructed at a height that makes it easy for adults to use and young children can also easily have access to the bed any time they feel like a nap. One of the factors many people consider when buying furniture such as the bed frame is the space in their homes. We can say that if you are looking for a bed frame that will not occupy so much space, this product should be worth your time for consideration. It is, after all, a single frame bed, so many people will have an idea of its size and the space it needs to fit in properly in a room. The manufacturers have thoughtfully allowed sufficient space to remain beneath the bed after it has been set up for use. You can choose to leave this space vacant or use it in many ways. For example, the space beneath the bed frame can be used to store bags, cartons, and other stuff you want properly kept out of sight until they are needed. We commend the designers for this creative feature which will help people who do not have so much space in their homes for a bed frame of this size and other furniture they might need. The bed frame is easy to set up. We noticed that many buyers will not have any problems setting up this single bed frame for use because of its simple yet attractive design which makes assembly easy. In the package, you will find a manual that includes the step by step process to follow when setting up the single bed frame. To give a rough time estimate, you may need only about an hour to set up the bed frame, and if you work fast, the time to get it done will be considerably lesser than an hour. We also noticed that it is possible to alter the appearance of the single bed frame. For those people who think the color of pine wood does not match the color theme they have chosen for their bedroom, the NEIDEN bed frame can be customized to meet their needs. The options for personalizing this single bed frame include staining it with your preferred color, waxing the bed frame or painting it to match the color theme you prefer to have in your bedroom. Parents can get this single bed frame for their children’s rooms. In the simplest terms, we can describe the design as suitable for both male and female. So your children will enjoy using this product, however, if there is a need for the frame to be customized, you can make things more interesting by painting the frame or using bed sheets that your children will like. The bed frame has an angled headboard. This feature particularly stood out because of the different ways it can be used for convenience. For example, people who enjoy using their laptops in bed or watching the TV will find the headboard particularly very convenient. The design has also been done in a way that the headboard is firm and fortified so you do not need to be too bothered about your weight. Alternatively, the bed frame can be placed by a wall. We also observed the options owners of this bed frame could use to keep it clean and well maintained at all times. To prevent accumulation of dust or dirt on the bed frame, you can keep it clean by frequently wiping the bed frame with a moist cloth. This cleaning action will improve the appearance of the pine wood and as the owner; you can get more satisfaction and fulfillment. In the case of stains, you can also wipe them off quickly. A dry cloth can be used for this cleaning action. Wiping the stains off the bed frame will surely remove all traces of the spill; however, if necessary you should use a moist cloth. Stains can also be removed from the surface of the bed frame with an eraser. This is a simple cleaning action, and it leaves no marks. Over time, the bed frame can be waxed again or re-painted if you feel the paint job has lost its glow. It is also important to avoid scratches on the bed frame because they deface the smooth surface of the pine wood. The NEIDEN bed frame is solid; a center support beam has been included in the design to make the bed frame firm. It also has a slatted base. From us, this is a good buy, and it is durable. IKEA’s Oppaland furniture series represents one of their higher quality lines in the offer. With such high quality, of course, comes a higher price but it is a well worth investment overall. 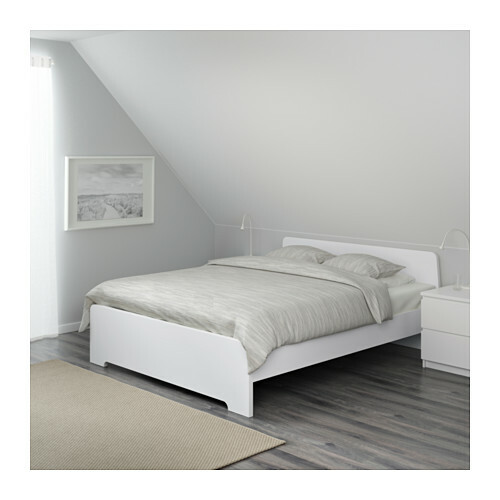 The Oppland series is designed to furnish your whole bedroom and provide you comfort and good night’s sleep. Its quality is visible when compared to other IKEA products, as you can see improvements in material combinations, ergonomic handles for good grips on drawers and many useful and functional features. 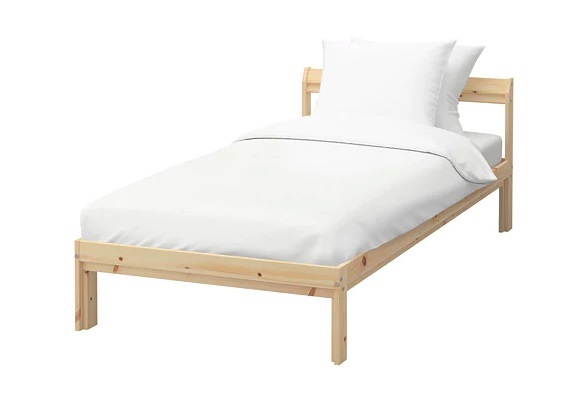 So, without further ado, here is why the Oppland bed frame is one of the best IKEA bedding solutions you can go for. The Oppland bed frame is perfect for those of you who enjoy reading or watching TV in bed. Its foam covered, the soft headboard is perfect for you to lean on and enjoy your time relaxing. 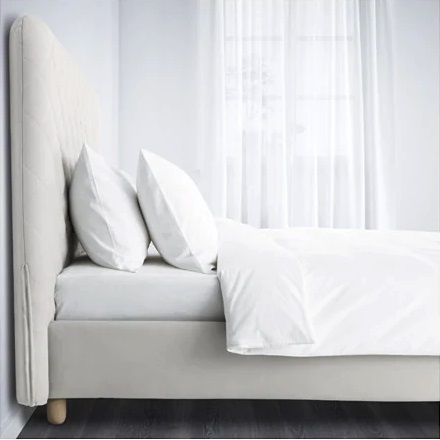 The headboard consists of plywood, solid hardwood, fiberboard, non-woven polyester fabric, polyester wadding and a layer of polyurethane foam of 2.2 PCF. 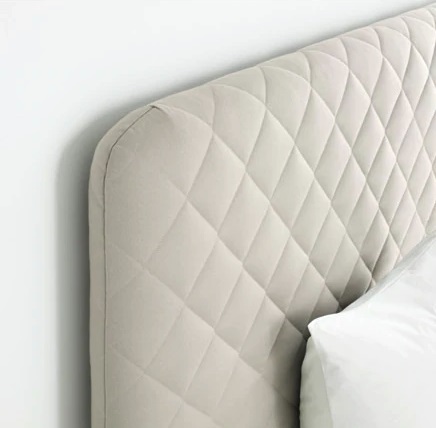 This highly convenient headboard also has a removable and washable cover, which makes it easy to clean. The cover consists of 97 % polyester and 3 % nylon. Other materials found in this bed frame are ash veneer, clear acrylic lacquer, ABS plastic, particleboard, fiberboard, paper, steel and pigmented epoxy powder coating. The main support beam is made of galvanized steel, which in combination with solid hardwood makes this bed durable and long lasting. This bed frame also has adjustable sides, allowing you to choose a mattress of any thickness. IKEA always recommends several coordinating products that work the best when matched with a specific bed frame and the Oppland bed frame was no exception. Even though the bed frame has adjustable sides and you can choose any thickness for your mattress, IKEA still recommends two of their mattresses as your best option. Those are the Haugsvar spring mattress, which goes for 399$ and the Morgedal foam mattress, which goes for 299$. You can choose depending on you mattress material preference or the budget. The Skorva midbeam comes included in the price, but it is stored at a separate isle. So, if you’re going to purchase this mattress in IKEA’s store, you will have to pick up the midbeam from its shelf, whereas, if purchase it online, the midbeam will come included in the package automatically. What isn’t included in the price is the bed base which you need to set up the complete bed. IKEA recommends the Luroy bed base as the best and highest quality choice at the price of 50$. 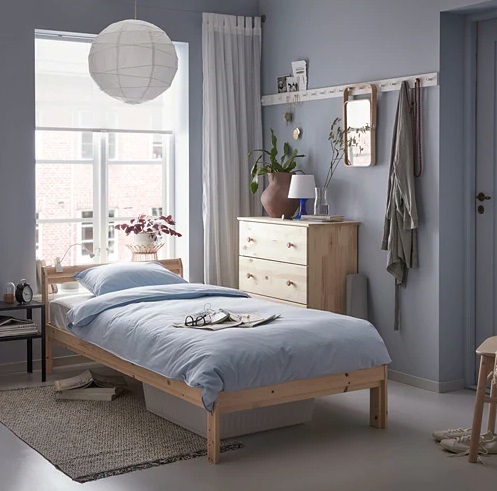 As far as other furniture goes, all products from IKEA’s Oppland series will go perfectly along this bed frame, especially the Oppland 2-drawer chest. If you need more storage space in your room, there is plenty of space underneath this bed frame to fit the Romskog storage boxes. While being convenient storage units, these boxes go well with the style of the frame and cost only 50$ a piece. We will have to trust the information IKEA has provided us. However, if you are interested in purchasing this bed frame, make sure to get a good look at in person and try it out first hand. From as much as we can see, the materials combination and the price suggest that the Oppland bed frame is very high quality. The combination of solid hardwood and steel makes it durable and sturdy, which is important to have when it comes to bed frames. The rich texture of the wood adds to its style and quality, making this one of the highest – end bed frames you can get at IKEA. This bed frame comes in two sizes, the king and queen size, as it was designed primarily for an adult bedroom. Keep in mind that the bed base is not included in the price as well as the mattress, which will add to an extra cost of approximately 400$ to 500$. The product comes in four packages, which is quite heavy since there are plenty durable materials in there. You may be able to transport the boxes yourself if you have a helping hand. However, you can still choose IKEA’s shipping service for a few extra dollars. The warranty is typically 25 years long and covers all manufacturing defaults, while there is no trial period for the product. 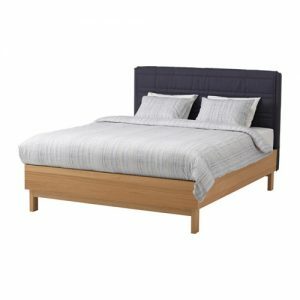 Is IKEA Oppland Bed Frame Good? This IKEA bed frame is a high-quality product you should give a chance to be tried if you have a larger budget to invest. It’s convenient foam covered headboard will allow you to relax comfortably while watching TV or reading in bed. From the information IKEA has given us, we can conclude it is a well worth bed frame that won’t let you down! As IKEA is famous for its highly affordable yet quality furniture, they are known as the makers of stylish furniture lines that will make your room look well designed even on a tight budget. One of those lines is the Undredal furniture line. This series is designed to equip your whole bedroom with one style, making it aesthetically perfect. The Undredal bed frame, just like all of the furniture from this series, has that handcrafted feel most people look for. In this review, we will go over all specs and information about the Undredal bed frame, provided by the IKEA store. The Undredal bed frame features a good, solid structure with a support beam made of galvanized steel. Other materials this bed frame is made of include fiberboard, solid birch, and acrylic paint. It’s simple yet stylish design gives your room a minimalist style look. 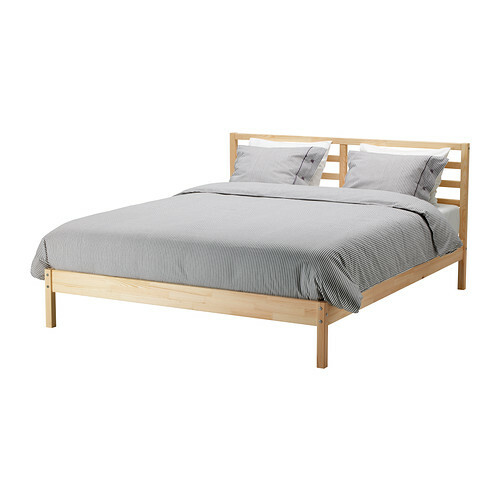 This IKEA bed frame has adjustable sides, which is a great feature you should be looking for in a frame. 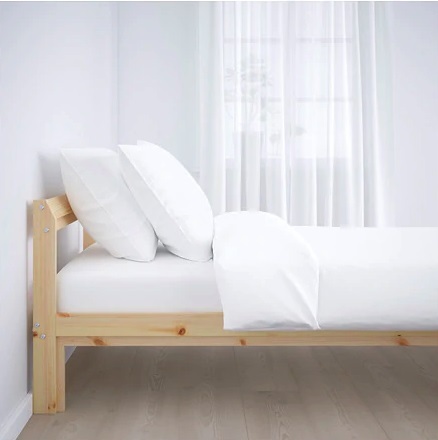 With adjustable sides, you don’t have to worry about the thickness of the mattress you own or you plan to purchase because the Undredal bed frame will fit a mattress of any thickness. The Skorva midbeam is included in the price of the bed frame. However, it is packaged separately and has to be picked up from a separate shelf in the IKEA store. 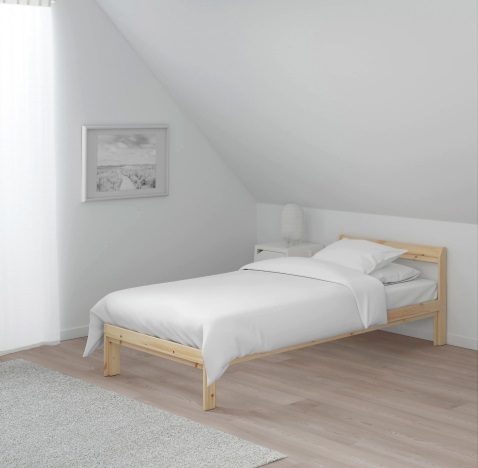 If you are purchasing your Undredal bed frame online, the Skorva midbeam will come included in the package and you don’t have to look for it on the site. Since this bed frame is a part of a whole bedroom furnishings series, the nightstand that goes best with it is Undredal nightstand, which goes for the price of 149$. When it comes to mattresses, IKEA recommends the Haugsvar spring mattress or the Morgedal foam mattress. Your choice depends whether you prefer spring or foam mattresses. The Haugsvar goes for 499$ while the Morgedal is slightly cheaper at 399$. However, keep in mind that the frame has adjustable sides and you are not obligated to purchase one of the IKEA’s recommendations. The bed base is not included in the price of the frame but it is necessary for the frame to function. 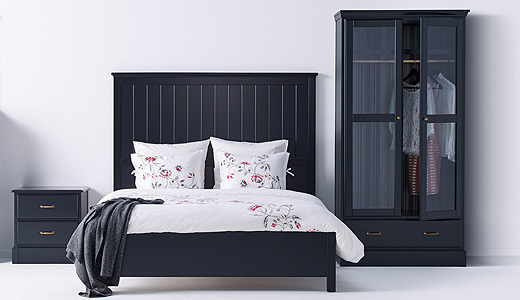 IKEA recommends the Luroy slatted bed base as the best choice for this frame model. In case you need more storage space in your bedroom, IKEA has found a way to suit your needs with Vardo storage boxes that can be stored underneath the Undredal bed frame. You can get one Vardo storage box at IKEA, at the price of 30$. According to IKEA, this bed frame is sturdy and durable. Since it is a part of a whole furnishings series, this bed from works perfectly with other products from the Undredal line. It can be combined with fabrics easily, to add some personal style to space. The product requires assembly, which is pretty easy to complete as long as you follow provided instructions. The bed frame comes in four packages that can easily be transported via car. If you want to rely on IKEA’s shipping service, you will have to pay a few extra dollars for it. This bed frame is available in two sizes only, which are king and queen size. As with all IKEA bed frames, you will be getting a 25 year warranty with your purchase. The warranty covers all manufacturing defaults and none of the damage done by the user. Unfortunately, there is no trial period for a bed frame like there is for a mattress in IKEA. Is IKEA Undredal Bed Frame Good? 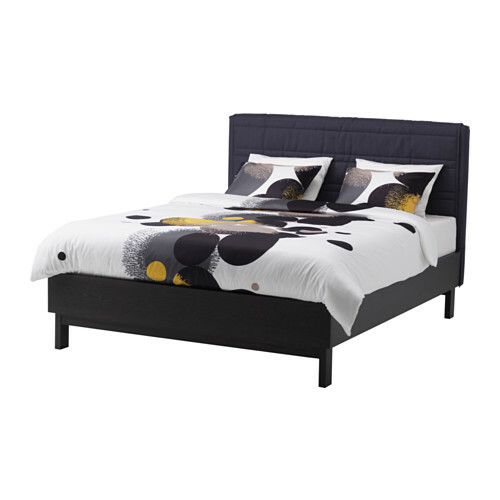 Overall, according to the information, IKEA has provided on the site, the Undredal bed frame is a good quality, durable frame that will do the job. Besides its simplicity and functionality, it adds to the style of the room when combined with other products from the Undredal series. It goes well with fabrics which allows you to personalize the space. 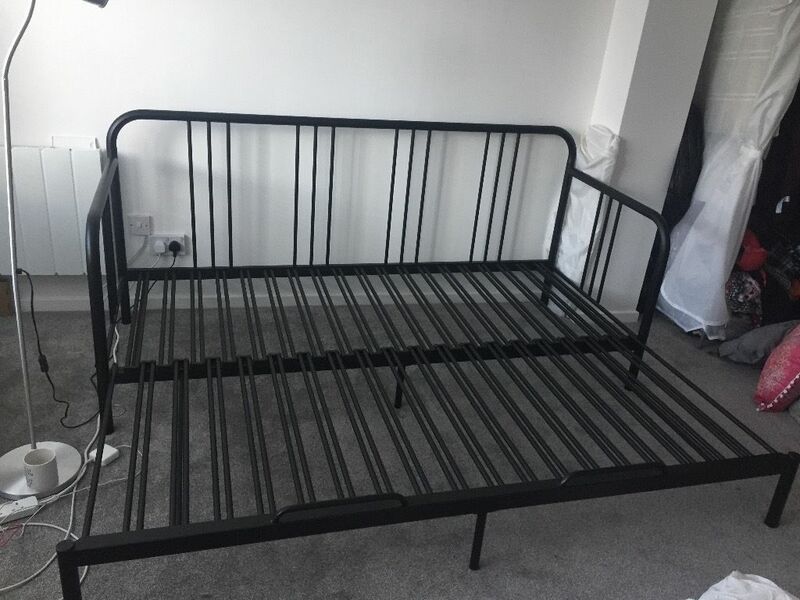 Even though there is no bed base included in the price, this bed frame is a pretty good deal, compared to other offers on the market. However, since there are no ratings or reviews that confirm the quality of this bed frame, make sure to test it out in one of IKEA’s store prior to making a purchase. When in search of a bed frame or any piece of furniture, looking into what IKEA has to offer is always a good choice. IKEA’s Fyresdal bed frame is a very convenient solution if you are in need of a bedding setup for guests. With its small yet functional structure, you can fit it in smaller rooms and maximize the use of floor space while still having enough bed space for your guest. Without further ado, in this review, we will present you the good and the not so good sides of this IKEA’s product, in hopes to help you make up your mind with the purchase. 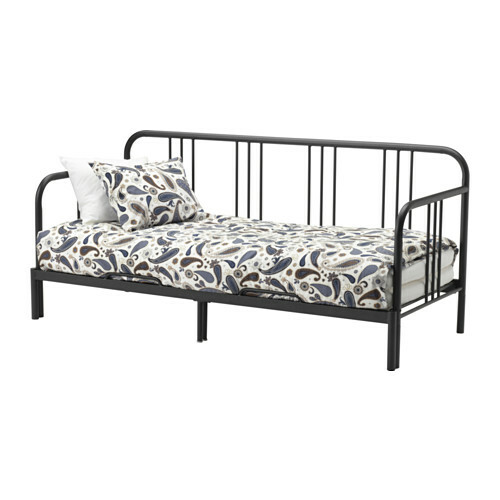 IKEA’s Fyresdal bed frame is a daybed frame that is designed to create more bedding space in a functional manner. The only two materials this bed frame consists of are steel and pigmented powder coating. This daybed frame must be combined with two twin mattresses in order to function properly. The two mattresses go on top if each other when you need to use the bed as a single bed, while when you are in need of a double bed, all you have to do is simply lift and pull out the extra bed base and place the second mattress on it. That way, the mattresses are next to each other, creating your double bed in just a few seconds. IKEA has recommended several coordinating products that suit the Fyresdal bed frame in different ways. Some of the products are optional while others are necessary to complete the bed or protect your furniture. Either way, IKEA encourages you to look into them. The first item they recommended is the Fixa stick-on floor protectors, which come in a set of 20 pieces per package at the price of 1.99$. With these floor protectors, you don’t have to worry about scratching the surface or damaging it while moving the bed or pulling out the extra base. Since you will need two mattresses to complete this bed setup, they should be of the same thickness which suits this frame. For that matter, IKEA recommends the Meistervik foam mattress in twin size. If you were hoping to get extra storage space with your bed frame purchase, IKEA has covered that as well. With Romskog storage boxes at 50$ a piece, you can store plenty of items while keeping your space stylish and clean. On the more optional note, you choose to purchase the matching Fyresdal nightstand which goes for 44.99$. Since it is from the same furnishings line as the bed frame, it will fit the aesthetic of it and bring harmony and style to your space. 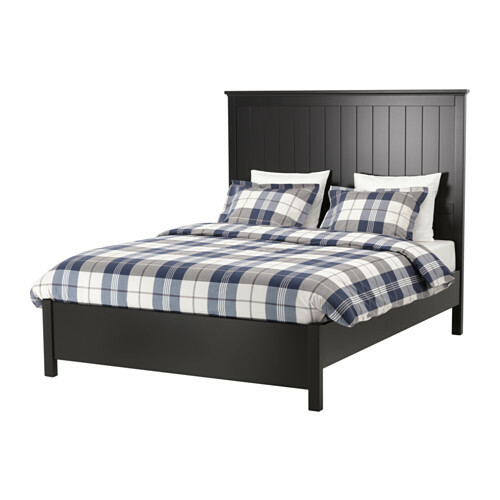 A good thing is that the slatted bed base is included in the price, unlike with many IKEA’s bed frames. The Fyresdal bed frame is a great bedding solution for a guest room or a teen’s room with less space. Its solid steel structure makes it sturdy and durable, meaning your frame will last long and do its job properly. It can be used as a single or a double bed, depending on how you need it to be. Such convenience and versatility make this bed frame perfect for overnight guests or kid’s sleepovers. Whenever you don’t need the double bed, you can make it into a single bed again and save some floor space in the room. This bedding setup can be transformed in a comfortable sofa by adding soft pillows and fluffy covers, that will make it your perfect book reading retreat. The plain style of this frame is easy to match with your personal styling choices, in terms of different colors and fabrics. Thanks to the powder coating that covers the steel, the frame is very easy to maintain. You can clean it thoroughly using a clean cloth and some mild detergent. The frame comes in three packages and requires assembly. Thanks to the packaging, you can easily transport it yourself and save the shipping money for other purchases. As usual, IKEA offers a 25 year warranty on this product. The warranty covers all manufacturing defaults and none of the damage done by the user. Is IKEA Fyresdal Bed Frame Good? It is a good quality product that is convenient and versatile. It is just what you need for a guest room or a small kid’s room, and it comes at an affordable price.